Hi! I design and illustrate newspapers, magazines, books, posters and packaging. Here's some of my work. 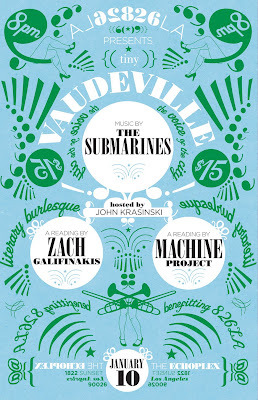 Here's a preview of the poster for Tiny Vaudeville, a new-for-2009 monthly event to be put on by 826LA. When i was researching Vaudeville I learned that the word means 'voice of the city' and has also been described as 'literary burlesque', which makes it a great match for a booksy setup like 826. The plan is to do three or four versions with different iconography (film projectors, books, typewriters, microphones, etc) and also more of the legs that I drew. Those silver strappy mary jane heels from J.Crew finally paid off! Oh - this information is not real - the names are for type tests only. I stumbled onto your site. I love your work. Impressive range and volume too! Keep on truckin, you're a terrific designer. mike forwarded me your blog..
i jumped when i saw the names on the posters, only later to read what you had wrote. the design is really beautiful (even though i'm sad to know that ryan gosling and sufjan and zach and john kransinski aren't going to be in the same building). if they were all in the same building, i'd probably spontaneously combust, so it's better this way. Hey! I'm from the Midwest and I live in Los Angeles. I design and illustrate books, magazines, posters, packaging and products. I've been a staffer on the Sunday Editorial section of the Detroit Free Press and on the Calendar section of the Los Angeles Times. Some of my freelance clients have included The New York Times, Chiat\Day, 826LA, McSweeney's and SMOG Design. I'm a bookworm and a music obsessive. You can see more work at cargocollective.com/amymartinillustration or amymartinillustration.com. Thanks!